TradCatKnight: FEMA Ordered 102,000 Boxcars With Shackles and Guillotines – Why Are Modern Guillotines On Military Bases Throughout North America? 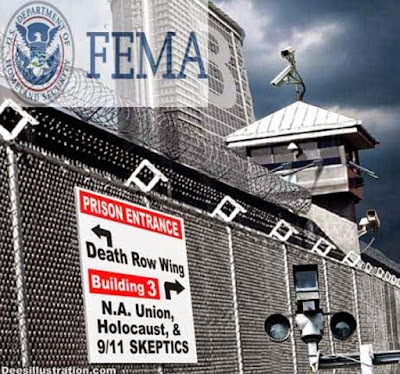 FEMA Ordered 102,000 Boxcars With Shackles and Guillotines – Why Are Modern Guillotines On Military Bases Throughout North America? I saw thrones on which were seated those who had been given authority to judge. And I saw the souls of those who had been beheaded because of their testimony about Jesus and because of the word of God. They a had not worshiped the beast or its image and had not received its mark on their foreheads or their hands. - Are the beheadings by muslims today meant to desensitize us against U.S. Government beheadings in the future? Think about this; Why does the US government need 30,000 Guillotines and over 600 Million rounds of hollow point bullets? There are over 800 prison camps in the United States. All fully operational and ready to receive prisoners. They are all staffed and even surrounded by full-time guards. But they are all empty. These camps are to be operated by FEMA (Federal Emergency Management Agency) should Martial Law need to be implemented in the United States and all it would take is a presidential signature on a proclamation and the attorney general’s signature on a warrant to which a list of names is attached. Ask yourself if you really want to be on THE list. READ MORE : RED LIST – BLUE LIST – YELLOW LIST – BLACK LIST .ARE YOU ON FEMA’S ‘KILL’ LIST? FEMA has three-layer boxcars for transporting shackled prisoners to the more than 800 empty and guarded concentration camps across the USA, with 20,000 new prisoner boxcars and 40-foot railroad containers arriving in Oregon from China for our forests for planned martial law in time for military exercises for martial law. My research and documentation on the boxcars and shackles goes far beyond Phil´s interview. Long before I heard of him, I had eyewitness information on these boxcars. A van full of eyewitnesses, missionaries traveling across America to evangelize and pray, stumbled across these boxcars in Montana, near Columbia Falls in Glacier. They described boxcars, in this case painted black, with shackles welded into them and a modern guillotine at the head of each boxcar inside. As they were photographing mountain scenery, they decided to follow railroad tracks into the wilderness so as to not get lost. This is how they came upon these boxcars with shackles. I later received a report from Lee Harrington of Valier, MT, who was a professional metal worker. He told me how in Glascow, MT, summer youth workers were employed to weld shackles into boxcars in that operation. They were then shipped west to Glacier and stored on remote sidetracks. Passing through the Blackfoot Indian Reservation in Cutbank, a local Blackfoot Indian, George Bullcalf, spotted these strange boxcars. When I interviewed local Patriots in Columbia Falls, they confirmed that hunters often stumbled upon such boxcars on remote train spurs in that wilderness region. I THEN TRAVELED TO PORTLAND OREGON, and lectured in the home of an actual employee of GUNDERSON STEEL FABRICATION. The wife of this high level executive called this meeting personally to make a public admission. In the meeting were OTHER GUNDERSON EMPLOYEES who had witnessed the prisoner boxcars in the higher than normal, three floor/three tier prisoner boxcars. She admitted that her husband finally told her that GUNDERSON WAS UNDER SECRET CONTRACT FROM THE US GOVERNMENT TO PRODUCE THESE PRISONER BOXCARS. She also admitted that Gunderson had a satellite factory for a boxcars with shackles operation in Texas. I later interviewed Russian immigrants in this area who admitted that some of their people were working at Gunderson, and one young man, Sasha, admitted working on prisoner boxcars and described them completely to his Russian Christian friends there. THE RUSSIAN COMMMUNITY NOW KNOWS ABOUT THEM AND IS VERY AFRAID OF THE IMPLICATIONS!!! Many Russians still work there. Metal worker Lee Harrington also described 20,000 CHINESE prisoner boxcars with shackles and modern guillotines, in the form of 40 foot railroad containers, coming into America via the west coast. They were ordered by the American government through a Senator who visited China and ordered these items. Workers unloading them became suspicious and began to investigate and discovered these horrors from China. Such 40 foot cargo containers from China are now piled up along the West Coast, especially around Long Beach Naval Shipyard, turned over the Chinese. I receive constant reports across America regarding these types of prisoner boxcars from former radio listeners and Patriots across America… and Canada. EVEN SWAT TEAMS ARE HELPLESS AGAINST THIS….. Recently, a former high level satanist from the mountains of North Carolina, now a Christian and receiving discipleship, admitted that boxcars with shackles were indeed in the mountains of NC and waiting for the hour of martial law. (Asheville, NC) He warned that many Patriots and Christians arrested and secured into these prisoner boxcars under martial law will never even make it to the death camps..that many will be tortured and sacrificed once restrained in these prisoner boxcars. want to be on Ashcroft’s list. Will asking questions be outlawed next? Several instances have recently been reported where those that were asking questions that came too near the untold truth (the cover up) were removed from the press conferences and from the public’s ear. Also, those that wanted to speak to the press were detained and either imprisoned, locked in a psychiatric hospital, slaughtered (through make-believe suicides) or discredited. Why are we all in denial over these possibilities? Didn’t we hear about prison camps in Germany, and even in the United States during World War II? Japanese individuals were rounded up and placed in determent camps during the duration of the War. Where was their freedom? You don’t think it could happen to you? Obviously those rounded up and killed didn’t think it could happen to them either. How could decent people have witnessed such atrocities and still said nothing? Are we going to do the same here as they cart off one by one those individuals who are taking a stand for the rights of the citizens as they expose the truth happening behind the scenes? Are we all going to sit there and wonder what happened to this country of ours? How could we let it happen? Am so grateful that before I read this article to remind us of "what evil lurks," I was reading the Gospels in the 1610 Douay Rheims Bible (drbible.org). The Old English word used was "OCCUPY"... The evil land-lord would leave his subjects to OCCUPY until his return at which point they would be expected to offer a "return" and defend the master. This parable is followed by the EVENT of Christ's entry into Jerusalem, into the Temple, the "house of prayer necome a den of theives." That one. WE are expected to OCCUPY God's creation and honor Him with a return and LOYALTY! Even in these times of seeming total OCCUPATION of EVIL we may still exercise "willful non-compliance" esp.to sin, and WILL to OCCUPY our little piece of life for GOD, in preparation for when only HE can and will make ALL things well again, His original purpose in creating us. Until then, OCCUPY, take up TIME and SPACE with the Presence of Christ! Happy SON-day! The FIRST day of the week ahead. The past is the past. The present is the gift and POWER of His Presence in the present! The "Crown" is still the "government" of this corporation knwn as the United States.